The Settings screen allows you to configure the behaviour of some of the functions and features within FitNotes. It also allows you to backup and restore your data when switching to a new device. Tap the button on the Home Screen and select Settings. Select Metric (kg) or Imperial (lbs) as the unit system to use when recording weight for an exercise. Select Monday, Saturday or Sunday as the first day of the week to display in the Calendar. The default value is set according to your locale. Select the default increment value used by the and buttons on the Training Screen. You can also specify a custom weight increment for an exercise to use in place of this default - see Exercise Notes. Enable this option if you would like to be notified of new Personal Records achieved for strength (Weight and Reps) exercises and for a icon to be displayed alongside PR sets. Enable this option if you would like a checkbox to be displayed alongside each set in your workout. 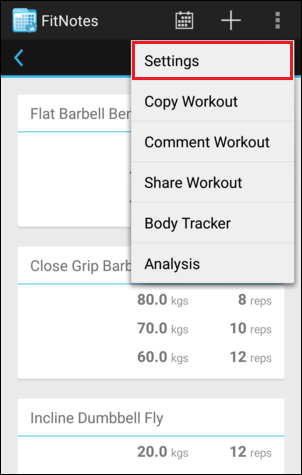 You can then tap the checkbox to indicate that a set has been completed in order to track your progression through a pre-planned workout. See Mark Sets Complete for more information. Enable this option if you would like your next set to be automatically selected on the Training Screen as you progress through a pre-planned workout. This allows you to quickly update the values of each set (Weight/Reps/Distance/Time) without having to manually select them from the list. Note that this is only applicable if the sets have been created in advance using a Routine or copying a previous workout. Enable this option if you would like to prevent the device from sleeping while the Training Screen is open. This can be useful if your device has been set to sleep after a short period of inactivity but you would like the screen to remain on while using FitNotes so that you can keep track of remaining rest time for example. Save a backup of all of your FitNotes data so that it can be restored onto a new device. The backup file will be named FitNotes_Backup.fitnotes or you can enable the Include Timestamp in File Name option if you would like to keep track of backups created on different dates. Select Cloud to save the backup file to a cloud storage service such as Dropbox or Google Drive. Note that the corresponding app for the cloud service you wish to use needs to be installed on your device. Select Device to save the backup file to the Internal Storage > FitNotes folder on your device. When enabled, a backup of your data will automatically be saved to your Google Drive account a short time (approximately 1 hour) after each workout. Your 5 most recent automatic backup files are stored within Google Drive and older backups are deleted to save space. Please note that the backup files can not be accessed directly within Google Drive as they are stored within FitNotes' specific App Folder but you can view/download/delete them by tapping Manage Backups on the Automatic Backup screen. Restore all of your FitNotes data from a backup file. Please note that when you restore a backup any FitNotes data that you currently have saved on the device will be overwritten. Select Cloud to restore a backup file from a cloud storage service such as Dropbox or Google Drive. Select the app you wish to restore from and then select the backup file (FitNotes_Backup.fitnotes). Select Device to restore a backup file from the Internal Storage > FitNotes folder on your device. Select Auto Backup to restore an Automatic Backup file from your Google Drive account. Please note that you will need to connect the same Google Drive account as was used when you enabled Automatic Backup initially. Generate a CSV file of your Workout or Body Tracker data so that you can view and analyze it in a spreadsheet application such as Microsoft Excel or Google Sheets. It is not possible to restore data from the CSV file - please use the Backup option for this. Select Cloud to save the CSV file to a cloud storage service such as Dropbox or Google Drive. Select Device to save the CSV file to the Internal Storage > FitNotes folder on your device.